Those familiar with the world of flash fiction are sure to know of Michael A. Arnzen. His work in the genre has resulted in the publication of numerous books and won him four Bram Stoker Awards and an International Horror Guild Award! 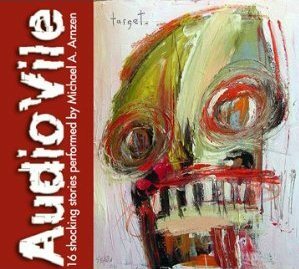 AudioVile is a collection of selected flash fiction from his book 100 Jolts: Shockingly Short Stories. In fact, the cover art for the CD is by Matt Sesow, who painted the cover for the book that spawned it. The back cover says that it’s “not so much an audio book as it is an album of flash fiction” and I’m inclined to agree. Rather than coming of as simple readings, many of the tracks seem closer to songs or poetry. For example, the opening track “Psycho Hunter” could easily work as a horror-themed rock song if a few words here and there were changed (especially thanks to Arnzen’s original backing music). Said track is the story of the search for a crazed hunter who preys on human beings, including several theories on why he turned out that way. “Obictionary” shows that flash fiction can be about anything, even an alphabetical list of how people died creative deaths. The somewhat light hearted music is a great touch. High school art class takes a nasty turn “In the Middle” while “Domestic Fowl” details a man’s quest to become a chicken. That might sound humorous, but the grotesque method of transformation is anything but. “Dreamachinery” deals with a man discovering that his wife’s sleep aid machine harvests more than nightmares and “Stabbing for Dummies” is a hilarious instructional slasher spoof (complete with a shout-out to Jason Voorhees). I think the use of a softer, somewhat distorted backing voice (also portrayed by Arnzen) to give tips and shortcuts contrasts nicely with his vocal work as he reads the main steps. The poem-like structure of “Why Zombies Lumber” goes well with the lurking funk “footsteps” that play under the theories (and eventual revelation) dealing with the titular inquiry. In “The Cow Café,” you are the star as your friend Kyle brings you to a coffee house located in the middle of nowhere Naturally, the reason for the Cow Café’s popularity is disturbing. The name “Brain Candy” might not make one think “zombie apocalypse,” but that’s what it’s about. More specifically, it’s a peek into the thoughts of a survivor as they rack up head-shots during a battle with an undead horde. “Driving the Sick Elephant” is a suspenseful tale wherein you’re riding through a dark jungle on a sick elephant. Both his performance and the exotic music that gets louder as time goes on really draws the listener into the story. “Take Out” shows that when you suffer death by pizza cutter, a take out box is your only logical coffin. “The Seven-Headed Beast” describes each very different head of the titular beast. I love the sheer creatively of this, along with the fact that researching it helped me answer a question that has bothered me for ages. I was really into the “Monster in My Pocket” toyline as a kid and despite my knowledge of various mythological and movie monsters, the identity of the seven-headed “Great Beast” character always alluded me. Now I know it’s a reference to the Beast from the sea from the Book of Revelation. Granted, I don’t think Arnzen’s beast is the same monster, but it’s still an interesting bit of trivia. In “Little Stocking Stuffers,” our cheery narrator tells us a charming story of children finding gory gifts one Christmas morning. “Six Short Films About Chauncey The Serial Killer” really benefits from its audio presentation, as the use of the sound of a movie projector running as a transition makes each segment seem more like a film than they might if you read them. The altered automated phone message at the end is a great touch. The desire to leave one’s body to science is noble indeed. However, the protagonist of “Donation” wants to be alive during the process! Finally, “Not The Reaper” offers the author’s philosophical musings on the nature of death. While what he compares death to seems ridiculous at first, it actually makes a great deal of sense when you really think about it. In another universe, this could have been a Soul Coughing song. Although running a little under an hour, AudioVile packs in plenty of material that’s sure to please horror fans. While some of the titles I’ve listened to in the past had somewhat predictable storylines, the flash fiction that makes up this release always kept me guessing. That said, this release definitely isn’t appropriate for children (as if the above-noted references to horror and gore weren’t enough of a clue). Just make sure to save reading the humorous liner notes until after you’ve finished listening, as they contain some minor some spoilers. Special thanks to Michael A. Arnzen for use of the image!